Harry and Snowman is a documentary film in production in the United States. The film is a story about the legendary career of jumper rider Harry deLeyer. The story begins in 1956 when Harry saved a horse from an American slaughterhouse. 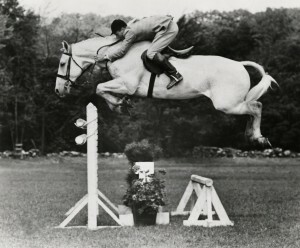 Snowman was featured on television talk shows and in newspaper articles – one said, “Although there were almost 800 horses in the show, for John Q Public there was only one that counted, and that was the chunky calm gray, Snowman.” Beyond the celebrity though, Snowman was an irreplaceable part of an amazing family of eight children. A Dutchman by birth, Harry is from the region of Noord-Brabant and lived in the village of St-Oedenrode. In 1945 or 1946 he rode in front of Queen Wilhelmina of the Netherlands. He married Johanna Vermeltfort. After leaving Holland for America, in 1959, Harry and his famous horse Snowman were invited back to the Netherlands for a “special jumping tour”. During that tour he won a Puissance class and rode in a parade. “We are searching for film footage, memories or stills of Harry deLeyer and Snowman in Holland. We are asking you to dig through your archives and attics and find information about Harry’s trip to Europe to help us make our movie come to life,” reports Lingh’s owner Karin Reid Offield, the Executive Producer of the film. Karin teaches and trains horses at her Brek-n-Ridge Farm in Harbor Springs, Michigan. For more information about the film, or to get in contact with the producer with film footage, photographs, stills or information, please visit www.HarryandSnowman.com and click on GET INVOLVED. You can also call Producer Ron Davis directly – from Europe 001-561-228-8885 or from America 1-561-228-8885.